Last week on Dr. Who, the Doctor and her friends traveled back seventy years to the partition of India to uncover the secret of Yas’ grandmother’s marriage. Yas is surprised to find that the man her gran, a Muslim married, was a Hindu. And as nationalism and ethnic tensions surged on both sides, her groom was murdered by his own brother as a traitor. Yas’ gran survived, and held on to the watch her husband of only a few hours had given her as a treasured token of their doomed love. It was a story of family history, doomed romance set against the bloodshed of the Partition, which resulted in 4 million Hindus, Muslims and Sikhs being slaughtered in bloody massacres. And its central theme was the inevitability of history, as Yas could do nothing to save her gran’s first husband. It was similar in this respect to the Classic Star Trek episode, ‘The City on the Edge of Forever’. Written by Harlan Ellison, this had Spock, Kirk and McCoy travel back to Depression-era America. There Kirk falls in love with a woman running a soup kitchen. But she’s an opponent of America entering the war in Europe, who dies in car accident. If she lives, America will not enter World War II, and humanity will never go to the stars. Kirk is thus faced with the terrible necessity of letting the woman he loves die in order to preserve history. It’s a good story, though I would have preferred one with a bit more science in it. The two aliens that appear, who the Doctor first believes are assassins and responsible for the murder of the Hindu holy man, who was to marry the happy couple, turn out instead to have reformed. Returning to find their homeworld had been destroyed, the two now travel through the universe to witness the deaths of those who pass unnoticed. They reminded me of the Soul Hunters in Babylon 5, an alien race, who travel through the universe to extract and preserve the souls of the dying at the moment of death. They are interested in ‘dreamers, poets, thinkers, blessed lunatics’, creative visionaries whose genius they want to preserve against dissolution. Dr. Who has a tradition of the Doctor going back in time to meet important figures of the past. One such influential figure in India was Maharaja Jai Singh of Jaipur, who constructed great observatories in Jaipur and Delhi. As you can see from the piccy at the top, the measuring instruments used in astronomy at the time were built out of stone there. To my eyes, the observatories thus have the shape of the weird, alien architecture portrayed by SF artists like Chris Foss, as if they were monuments left by some strange future extraterrestrial civilization. In this respect, special mention needs to be made of Majaraja Sawai Jai Sing II (1688-1743) of Jaipur, who was not only an able king but also a skilled astronomer and patron of learning. He built five observatories in different locations in Northern India. The observatories now standing majestic and serene in Jaipur and Delhi bear testimony to his abiding interest in astronomy and to his efforts for augmenting the astronomical tradition with an open-mindedness. 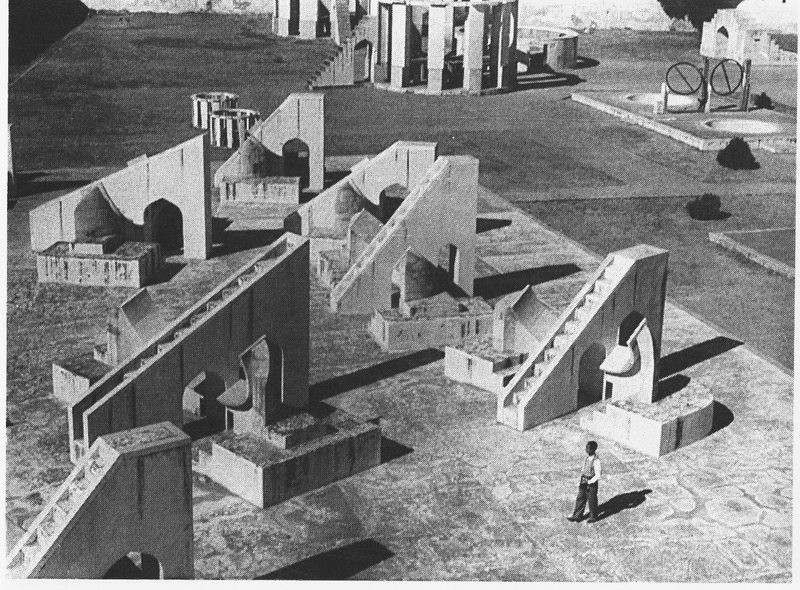 The observatory at Jaipur has a large number of instruments – huge sun-dials, hemispherical dial, meridian circle, a graduated meridianal arc, sextants, zodiacal complex, a circular protractor (which are masonry instruments), as well as huge astrolabes. Sawai Jai Singh II meticulously studied the Hindu, Arabic and the European systems of astronomy. He was well aware of Ptolemy’s Almagest (in its Arabic version), as also the works of Central Asian astronomers – Nasir al-Din at-Tusi, Al-Gurgani, Jamshid Kashi and, more importantly, of Ulugh Bek – the builder of the Samarqand observatory. In fact, it was the Samarqand school of astronomy that appears to have been a great source of inspiration to Jai Singh in his astronomical endeavours. No less was his interest in European astronomy. In his court was a French Jesuit missionary who was an able astronomer and whom Jai Singh sent to Europe to procure for him some of the important contemporary European works on astronomy. He studied Flansteed’s Historia Coelestis Britannica, La Hire’s Tabula Astronomicae and other works. He was well aware ot he use of telescope in Europe and he spared no efforts in having small telescopes constructed in his own city. In the introduction to his manum opus, Zij Muhammad Shahi, which is preserved both in Persian and Sanskrit, he has recorded that telescopes were being constructed during his lifetime and that he did make use of a telescope for observing the sun-spots, the four moons of Jupiter, phases of Mercury and Venus, etc. However, in the absence of a critical evaluation of his treatise, it is rather difficult to opine whether Jai Singh was able to determine the planetary positions or movements with the help of a telescope and whether he recorded them. No positive evidence has yet been unearthed. The principal court astronomer of Jai Singh II was Jagganatha who was not only well versed in Arabic and Persian but also a profound scholar of Hindu astronomy. He translated Ptolemy’s Almagest and Euclid’s Elements from their Arabic versions into Sanskrit. The Samrat Siddhanta, the Sanskrit title of the Almagest, is indeed a glorious example of the open-mindedness and generous scientific attitude of Indian astronomers. (pp. 36-8). It would be brilliant if there was a Dr. Who story using this fascinating, historic location, but as it’s almost certainly a prized national monument, I doubt very much the Beeb would be allowed to film there. Still, perhaps something could be done using CGI and a lot of imagination. I realise that the history of mathematics is an arcane subject, that few people will have much interest in, having struggled enough with the subject at school. But with Black History Month, there is immense interest amongst scholars of Black and Asian history about restoring Black and Asian scientists and mathematicians to their rightful place in history. Mathematics is the only true international language. men can communicate more directly, precisely and logically in pure mathematics than in any other tongue. Moreover we have much to learn from the achievements of past civilizations in this field: even modern computers have not fathomed all the intricacies of Stonehenge. 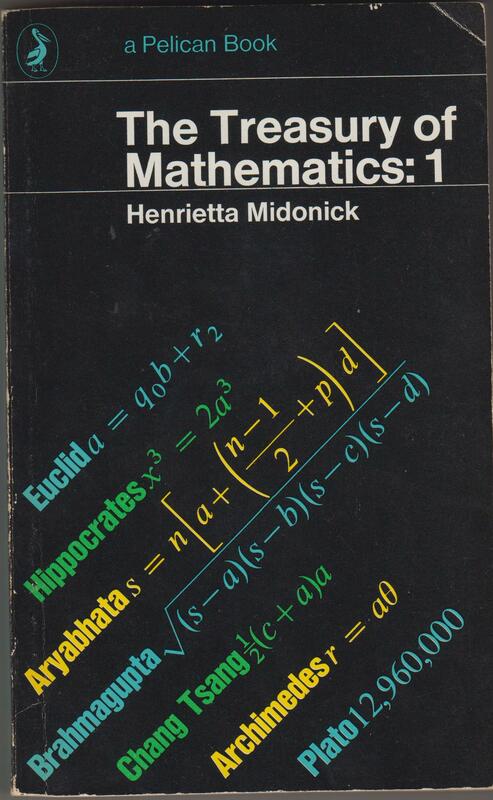 In this fascinating collection of original sources (many of them published in a popular edition for the first time) Henrietta Midonick shows individual mathematicians grappling with varied problems – some practical, such as architecture, money valuation, mechanics, astronomy and calendar calculation; others verging on philosophy, such as the existence of zero and the concept of infinity. Her arrangement also demonstrates the growth of key ideas in geometry, arithmetic, logic and calculus. Volume 1 documents the growth of mathematical science in the civilizations of Babylon, Ancient Egypt, the Mayas, India and China, and assesses the revolutionary discoveries of Plato, Archimedes and Euclid in classical antiquity. Among the various extracts are pieces on Babylonian mathematics; four geometrical problems from the Moscow Papyrus, which dates from Ancient Egypt, c. 1850 BC; the Rhind Mathematical Papyrus, again from Egypt, c. 1650 BC; the Bakhshali Manuscript, from 4th century AD India; the Mayas – discussing their system of numbers, the calendar, arithmetic and chronology, and the Quipu, the method of keeping statistical records using knots, used by the ancient Incas in South America. Chinese mathematicians include Wan Wang, from the 12th century BC, Chou Kung, c. 1100 BC; Chang Tsang, died 152; Liu Hui, 3rd century AD; Sun-Tsu, from the same century; Hsia-Hou Yang, 6th century AD; Wang Hs’iao-T’ung, 7th century AD, Li Yeh, c. AD 1178-1265; Ch’in Chiu-Shao, c. AD 1250; Yang Hui, c. AD 1275; Chu Chi-Chieh, c. AD 1300. The Indian scholars collected include Aryabhata the Elder, c. AD. 476; Brahmagupta, AD 598; and Bhascara Acharya, AD 1114-c. 1185. It also includes the Algebra of Mohammed ben Musa al-Khowarismi, who founded much of modern algebra, including giving it its modern name. The two Jewish mathematicians collected include the Mishnat ha-Middot of Rabbi Nehemiah, from c. AD 150; and the Method of Division of Immanuel Ben Jacob Bonfils, c. AD 1350. The ancient Greeks include Hippocrates of Chios, 5th century BC; an extract from Plato’s Dialogues; the Elements of Euclid of Alexandria, c. 300 BC; Apollonius of Perga’s Conic Sections, from the same period; Archimedes’ On Spirals, Mechanical Problems, and Quadrature of the Parabola, Pappus, c. AD 300, and Proclus, AD 410-485. 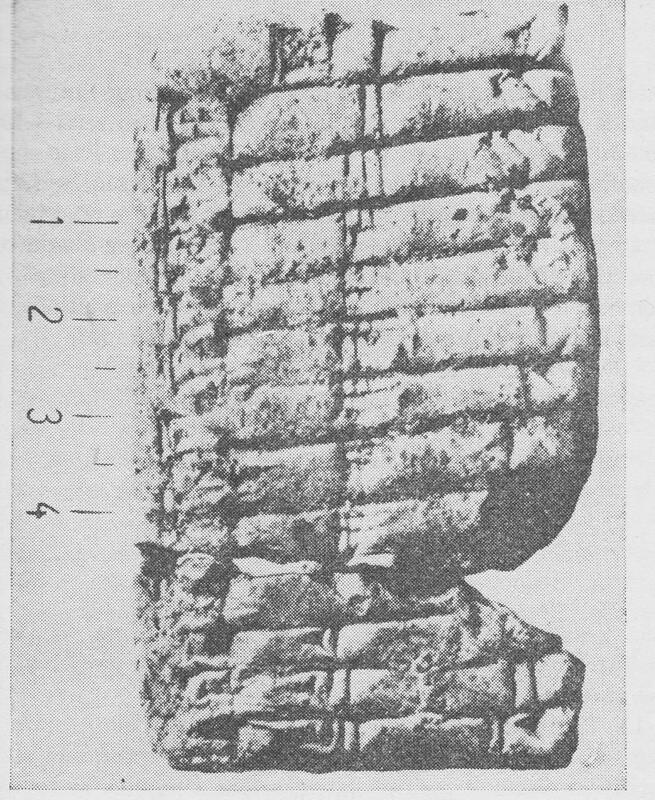 Ancient Babylonian Multiplication Table for X 10. For the non-mathematician like myself these texts aren’t easy reading. There are diagrams to help, but many of them, as the pioneering works of their time, are trying to express difficult mathematical ideas without the modern language of Maths, and so it can be difficult understanding what they are trying to describe. Nevertheless, this is an important collection of some of the classic texts of ancient mathematics on which the structure of modern maths has been built.